Nearly twenty years ago, deep in the heart of South Africa, a group of hardy Afrikaners constructed Orania, a whites-only town that they hope to make the capital of a future country. Is Orania a place meant to preserve the culture of the “white tribe of Africa” or a haven for supremacists bent on restoring apartheid? 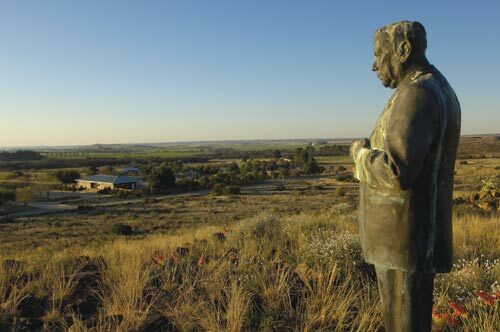 A statue of former South African Prime Minister Hendrik Frensch Verwoerd overlooking Orania. Perched on a hill overlooking a dusty town stands a three-foot statue of Prime Minister Hendrik Frensch Verwoerd. Acknowledged by all but the most die-hard of supporters as an unrivaled villain in South African history, Verwoerd is known as the architect of “grand apartheid.” While “petty apartheid” had ensured that restaurants and other public places would be subject to the same sort of segregation found in Jim Crow America, it was Verwoerd who, with the mad zeal of the social scientist, implemented a policy of forced removal by which the government razed homes, loaded blacks onto trucks, and deposited them in remote Bantustans. A statue of Verwoerd (who was knifed to death by a parliamentary messenger in September 1966), however diminutive, seems totally out of place in the new South Africa, that country born in 1994 and constantly touted as a land transformed. Over the past fourteen years, symbols of South Africa’s apartheid history have been removed and painted over, from the national anthem to Afrikaans street signs to the name of the Johannesburg airport. But this town, Orania, is like none other in South Africa. Like the “black spots” of the apartheid era—small pockets of black-inhabited land in designated white areas—Orania is an island unto itself. A large sign beside an (always open) entrance gate that abuts the highway reads: orania: afrikanertuiste—the Afrikaner homeland. Though it has been condemned as the last vestige of apartheid, Orania is not as much of an anomaly as it might initially seem. Most South African neighborhoods, if not whole towns, are dominated by one particular ethnic group. The crowded townships surrounding South Africa’s major cities are historically—and remain exclusively—black. Despite its multiracial pretensions, South Africa continues to be a highly segregated society. 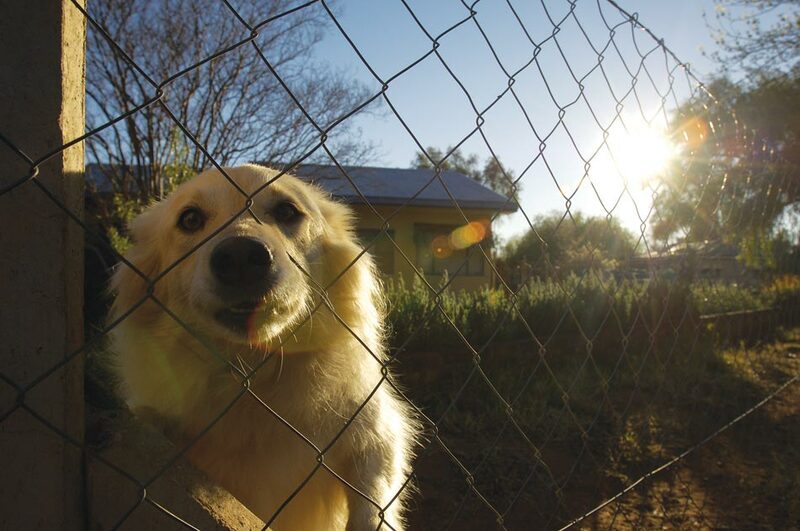 Indeed, Orania’s racist underpinnings are belied by its idyllic setting and the friendliness of its inhabitants. Modest, one-story homes on small lots with toys in the yard make up the majority of the town’s developed land. A church and school stand in the town center. Orania has a gas station, a supermarket, and a number of small shops. The inn where I stay with my English photographer, Sebastian, is like a shrine to Afrikaner kitsch, with figurines of Boer Wars soldiers and pictures of nineteenth-century pioneers driving covered wagons decorating the walls. “Green River” plays in the background over our meals in the dining room. But then, early one morning, Norman, a man in his late fifties, drives by and sees Sebastian, an outsider, taking photos. 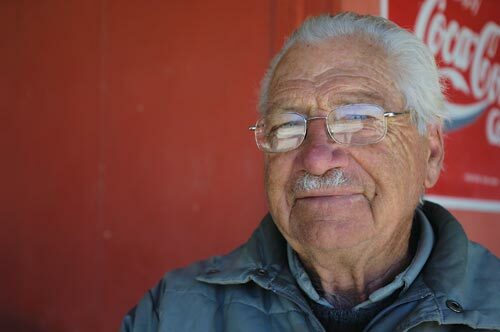 Norman, who has lived here five years, explains that he moved from Cape Town, like many Oranians, to escape the rampant crime of the city. Sebastian looks at him with a blank expression, awaiting the inevitable. “Ape Town,” he laughs and drives off. A white dog guards a property line in Orania. Afrikaner history began in 1652, with the settlement of the Cape of Good Hope by the Dutch East India Company. From that point forward, settlers arrived in a steady stream, and from this mix of French, German, and mostly Dutch immigrants emerged the Afrikaans language. From the combination of Afrikaans, a frontier mentality, the advent of the printed word, and a distinct Calvinist faith emerged the ethnic consciousness of the Boer or, less colloquially, the Afrikaner. Following the second British conquest of the Cape in 1806, Afrikaners fell under English rule. Guided by a religious conviction that preached the superiority of whites and the separation of the races, they opposed the British policies of emancipation for black laborers and in the 1830s launched the historic Great Trek away from the Cape into the interior of South Africa. The Trek has become part of Afrikaner mythology and represents independence, hard work, and fortitude. Critics, however, saw the move as an extreme example of the laager, an Afrikaans word meaning a “defensive position,” commonly used to describe Afrikaner misanthropy. Oranians see their town as a continuation of that trek—a trek away from modernity and integration, a circling of wagons and a retreat from the outside world. The Afrikaners slowly rose to power in South Africa, eclipsing the British and subjugating the blacks: first with the election of the Afrikaner-dominated National Party in 1948, then through the implementation of apartheid laws throughout the 1950s, and finally with Prime Minister Verwoerd’s decision to abandon the British Commonwealth in 1961. For decades, Afrikaners ruled the power structures of South Africa (government, media, business) via the Broederbond, a secretive organization that counted as members every prime minister, many influential journalists, clergy, senior military officers, the captains of industry, and thousands of other Afrikaner men dispersed across the country. With the implementation of apartheid, Afrikaners went from anti-imperialist freedom fighters to “the polecat of the world” (in the words of a one-time editor of the Afrikaans newspaper Die Burger). By the 1980s, Afrikaners had become part of that club of ethnic groups (along with the Serbs, Turks, Hutus) forever condemned to pariah status. It seemed impossible that the international community would lift a finger to assist a people stereotyped as knuckle-dragging racists. So in December 1990, nearly a year after the release from prison of Nelson Mandela (who served twenty-six years of a life sentence) and with the demise of white rule on the horizon, a group of thirty right-wingers known as the Afrikaner Freedom Front purchased Orania from the government for the modest sum of 1.5 million rand—roughly $200,000. Situated in the middle of the Great Karoo, a barren region of scrub about halfway on the 870-mile journey from Johannesburg to Cape Town, Orania was built by the government in 1963 on the banks of the Orange River (thus its name) to house the labor force constructing a nearby dam and irrigation system. But once the dam was completed some twenty years later and the workers departed, Orania became a ghost town and fell into disrepair. By the end of the 1980s, the town held only squatters. In a scene eerily reminiscent of Verwoerd’s forced removals, Orania’s new owners evicted about seventy so-called colored (the word used to classify mixed-race people in South Africa) families. The deteriorating, prefabricated houses were refurbished, the land was irrigated, and about 350 Afrikaners settled down. They selected as their leader Carel Boshoff, a former head of the apartheid-era Bureau of Racial Affairs and professor of theology at the University of Pretoria. Orania “opened” officially on April 11, 1991. For a place so small, remote, and sparse, there is an astoundingly frenetic atmosphere in Orania. More than a town, it is a cause, a rebellion against multiracialism in a land devoted to that ideal, and its inhabitants are faithful adherents to their weltanschauung and their people, not their newly democratic nation. Indeed, the hope of its founders was that Orania would form the nucleus of a nascent Afrikaner country, or Volkstaat. It would stretch from the Karoo to the border with Namibia in the north and five hundred miles west of the diamond-mining city of Kimberley all the way to the Atlantic Ocean, forming an Afrikaner “corridor” in the western part of present-day South Africa. Orania’s leaders acknowledge the improbability of achieving an Afrikaner homeland in the near future—certainly not while the perception of them as hard-line racists persists. South African President Thabo Mbeki has explicitly said that acceding to the creation of a Volkstaat is “not ANC policy,” but Oranians insist that the creation of an Afrikaner homeland is not a reaction against black rule but rather a step forward in preserving their culture. Dr. Tienie Mynhardt is a gregarious fifty-five-year-old former civil servant who tells me that he was “part of the rat race” in Pretoria before settling down in Orania. He describes himself as “a child of apartheid” and assures me that he’s “here, absolutely, for the essences of the Afrikaner culture” and not to escape from a black-dominated country. Mynhardt says he was originally optimistic about the future of his country after the South African “miracle” of 1994. He points to Mandela’s public encouragement of black South Africans to support the country’s rugby team, the Springboks, in the 1995 World Cup as an example of an ease in race relations. Rugby has traditionally been an Afrikaner sport in South Africa, and when the national team won, Mandela, in a Springboks jersey, presented the team’s Afrikaner captain with the trophy. This feeling of being left out is hardly exclusive to Afrikaners; it has been a trope in the South African national narrative ever since the fall of apartheid. It has most recently taken shape in the popularity of an Afrikaner folk song, “De la Rey,” valorizing a Second Boer War general, which has ignited a national controversy. The artist who wrote the song, Bok van Blerk, says he was inspired because “in South African schools, there’s four lines in the history books … about the Anglo-Boer War, and I think that’s crazy.” Official title changes of provinces, cities, airports, and schools from Afrikaner to traditional African names, the imposition of wide-scale affirmative action programs in both the public and private sectors, the dramatic reduction in the number of Afrikaans-language schools, and an increasing number of violent attacks on Afrikaner farmers have contributed to what a black writer in South Africa’s influential Sunday Times referred to as a resurgent “siege mentality” among Afrikaners. Once again, the Afrikaners are retreating into their laager. Since 1994, millions of whites have left South Africa for the English-speaking world. However, Afrikaners, unlike South Africans of British descent, do not have a Commonwealth to flee to—even though an astounding 20 percent are said to be living abroad. Frans de Klerk—the bearded thirty-eight-year-old director of the Orania Movement—moved here in 1993, when the last apartheid-era president, F. W. de Klerk (no relation), was preparing to hand over power. Frans’s bookshelf is filled with the works of Naomi Klein, the radical Canadian journalist whose book No Logo has become the Bible of the antiglobalization and anarchist left. While he would balk at Klein’s liberal politics (and she at his brand of ethnic paleoconservatism), he is on board with her critique of capitalism and materialism. He decries South Africa as a nation of forty million “consumers” and warns that “the Western world has got big problems in terms of sustainability.” Liberal capitalism, he says, is “easier for business. There’s no borders, no restrictions, everyone wears the same clothes and talks the same language, and they make more money, but the communities are not empowered. They’ve got no influence over decisions that affect them directly. It is not a version that we like. Democracy is where people on the ground take more responsibility.” Orania stands proudly athwart the rush to open borders, open markets, and globalization. Despite the protestations of its founders, Orania at first glance does seem like a last-ditch effort to preserve the system of rigid racial segregation. But the town’s residents are quick to point out that the economic structure of South Africa made actual, permanent segregation under white rule impractical—as the country was, and is, based upon mining and other heavy industry that mandate a large (and largely black) labor force in cities. So the dream of separating the races into their own distinct nations was undermined by economic reality. But whereas grand apartheid sought to exploit and subjugate blacks, Orania seeks nothing more than separation. They are perfectly willing, they say, to accept the postapartheid South African political arrangement—not that they have the numbers or power to say otherwise. So when I ask de Klerk if Orania is a continuation of apartheid, he grows visibly annoyed. “It’s an Afrikaner project,” he says. “Like saving the whales is a whale project”—except that Orania is saving the Afrikaner ideals of hard work and selfwerksaamheid, self-reliance. Apartheid encouraged white laziness, de Klerk says, what with its easy provision of cheap black nannies, maids, and gardeners, but here the unofficial slogan is Orania is nie vir sissies, easily translated as “Orania is not for sissies.” You see it on bumper stickers—the slogan under the picture of a boy in overalls pulling up his shirtsleeve—and emblazoned on the unofficial flag of Orania. From its invocation of the Great Trek to its philosophy of self-reliance and communalism, Orania is the purest instance of Afrikaner atavism. Eleanor Lombard, the pleasant, sixtyish woman who manages the town’s external relations, and her husband, Pieter Grobbelaar, who harbors a die-hard Afrikaner dislike of Britons (especially ones toting cameras), are suspicious of Sebastian. “The English don’t like us, since the Anglo-Boer War,” Grobbelaar explains to me through his heavy accent. “If you came as a black photographer, no problem. We’re quite relaxed about it,” Lombard adds. Grobbelaar smokes a pipe, and with his rugged demeanor and muttonchops bears a resemblance to Paul Kruger, the last president of the independent Boer Republics and the George Washington of Afrikaner history. 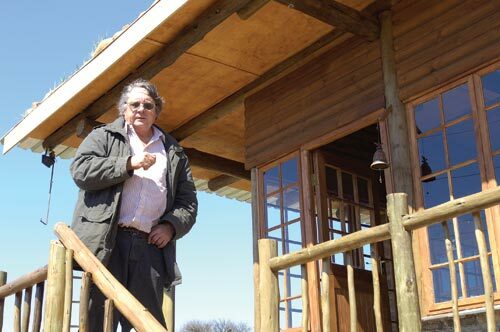 Pieter and his wife live in an ultra-modern house that he says was built by three men in one hundred days. The couple grows alfalfa on the roof. “People come and visit us and think we’re the Amish,” Grobbelaar tells me, but the two are not as austere as at first they might appear. They keep a second home in Cape Town with a stunning view of Table Mountain, but they prefer to stay in Orania. “When you’re in Cape Town you have a firearm under your pillow,” Grobbelaar says. When I ask him if Orania has any semblance of a police force, he laughs, “To do what?” In emergencies, Orania depends on the local police of nearby Hopetown. Pieter Grobbelaar on the porch of his home. “The cultural difference is huge,” Lombard says, in the world-weary way of a college professor. “African Americans are much more Westernized than the African or black people that we have here,” she tells me. She points out the window. “They slaughter oxen,” she says. “I have a lot of respect for their traditions,” Eleanor continues, as if to counteract her husband’s outburst. There is perhaps no more visible expression of this divestment than the virtual disappearance of the Afrikaans language from public life. “In the judicial institutions they don’t use Afrikaans, in parliament they don’t use Afrikaans, in public service they don’t use Afrikaans.” Even the schools, Boshoff says, were initially bilingual but are now moving away from teaching Afrikaans. Indeed, there are only three hundred schools in the country where Afrikaans is used as the medium of instruction, down from two thousand in 1994. Ten years ago there were five Afrikaans universities; now there are none. In reaction to this trend, Orania is proudly Afrikaans-speaking. 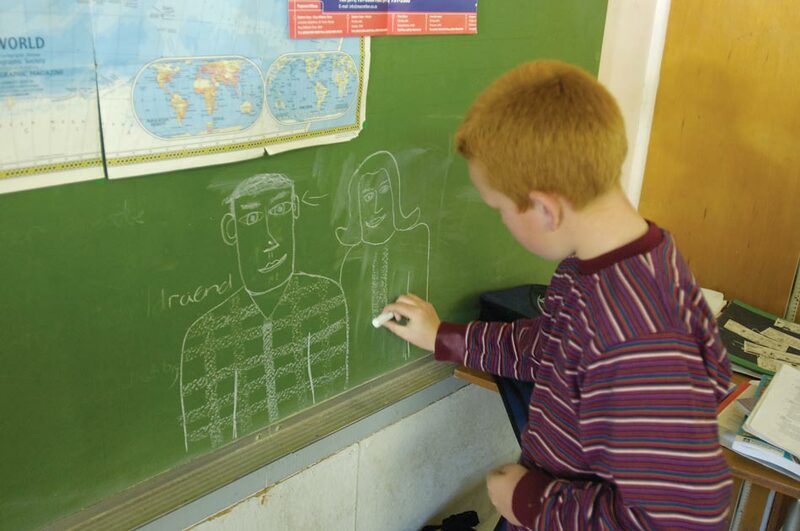 At the Volkskool Orania—one of two schools in town, a Montessori-type, “self-driven school”—Afrikaans is the language of instruction, with English taught only as a second language. Wynand Boshoff, a teacher there, explains the intention is to instill an appreciation for Afrikaner heritage. “If an ethnic group disappears,” he tells me, “it’s as great a loss to mankind as if a life-form disappears. The Afrikaner has a real chance of disappearing.” But despite the repeated insistence that such teaching is not intended to exclude other cultures or languages, Orania is a bubble. Internet access is scarce, and the only newspapers to be found are in Afrikaans. Afrikaner holidays (such as the Day of the Vow, commemorating when Boers resisted a Zulu warrior attack in 1838, during the Great Trek) are celebrated, but South African national holidays, many of which commemorate the struggle against apartheid, are not. Movies are shown Friday nights in the school hall; otherwise, outside influences such as television and pop culture play little to no role in the lives of townspeople. A boy at the Volkskool Orania. Meanwhile, Afrikaner culture lauds even its most pedestrian accomplishments. 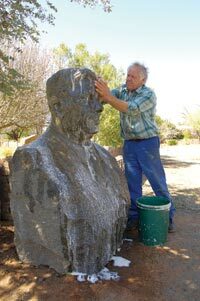 For example, Orania recently constructed a fiberglass monument to the koeksister, an Afrikaner pastry—which may have its actual origins in Malaysian culture, having been imported by slaves brought to South Africa in the seventeenth century. The monument earned Orania many snide articles in the South African press, but it is nevertheless a source of civic pride. And, as if the squat Verwoerd statue overlooking the town were not enough, there is the Verwoerd Museum, a small, prefab house where Betsie Verwoerd, the prime minister’s widow, spent her last years. It is chock-full of Verwoerd memorabilia, including some of Betsie’s dresses, the chair in which Verwoerd sat during the first attempt on his life (when he was shot in the face), even the suit and shirt he wore when he was fatally stabbed in parliament. Outside the museum, one of the town’s citizens washes a huge bust of Verwoerd that was placed this very week on the lawn. The bust had been sitting in storage at Pretoria Hospital, long since discarded after the end of apartheid. Upon hearing of its likely fate in a trash heap, the residents of Orania went to collect it for posterity. The Orania Cultural History Museum, curated by an elderly man with the classic Afrikaner name Kokkie de Kock, is devoted almost exclusively to articulating Afrikaner pride in the Boer Wars and grievance over the eventual loss to the British in the Second Anglo-Boer War. There is a life-size replica of a British concentration camp, earnestly depicting the internment of Afrikaner women and children, 26,000 of whom died during the course of the war. “We can’t forgive for that,” de Kock tells me. One room of the museum is devoted to busts of apartheid-era presidents. Every single one of them is there: huge, imposing, dour faces. All of them, that is, except for F. W. de Klerk, who negotiated his country’s peaceful transition to democracy and shared a Nobel Peace Prize with Nelson Mandela. “No, he’s not here,” de Kock laughs when I asked if de Klerk’s bust was hidden somewhere. He considers de Klerk . . . what is the word for “a person who sells out his country”? Carel Boshoff, founder of Orania. A bust of former South African Prime Minister Hendrik Verwoerd. Perhaps, too, the government can afford to be generous toward Orania, because the separatist cause has been losing political steam. Freedom Front Plus, a conservative Afrikaner political party, has lost seats in the national parliament, and most Afrikaners finally are coming to the realization that they are living in a country that will be henceforth governed by a black majority. Rejection by the vast majority of their fellow Afrikaners is a reality to which Oranians have resigned themselves. Even Frans de Klerk admits that most Afrikaners have no intention of moving to Orania, nor do they support the establishment of an Afrikaner state. But, he says, “when Theodor Herzl wrote his book on the Jewish state there were a lot of Jews against his whole idea, and so it took some time to persuade them, and it will take us some time to persuade the Afrikaners.” It is not for nothing that some Oranians have called Boshoff the Afrikaner Ben-Gurion. My last night in Orania, I head over to the Volkskool auditorium to hear a recital by a world-renowned Afrikaner pianist. About fifty of Orania’s adults sit around long candlelit tables, eating nuts and drinking glühwein, a warm alcoholic drink. As I enter the auditorium, I approach Carel Boshoff, who is speaking with John Strydom, a medical doctor who now serves as the town’s tourism director. “I didn’t convince him,” Boshoff says to Strydom while looking at me, smiling. “You made a good case,” is all I can muster. Sitting in the auditorium listening to the masterful recitalist, sipping the pungent glühwein, I am struck by an incongruity in the scene. The music is beautiful, flawlessly played. The people around me, many of whom welcomed me into their homes, are generous and warm. But underneath this pleasant picture lies an ugliness, a fear that scarred this country for so long and that continues to plague it and probably always will. Lawrence Schlemmer, a South African academic, put it well when he told Britain’s Daily Mail several years back that the people of Orania “are more idealists than racists.” That seems like an accurate description, if a little easy on the Oranians. I ask Frans de Klerk whether he sees similarities between the Afrikaner tribe and the black tribes of South Africa, and if these commonalities ever disabuse him of the notion that Afrikaners must live separately to maintain their heritage. “I think we’ve got a lot in common with them,” he tells me. “But Africa has got a problem. There’s a saying that for the nation to survive the tribe must die.” For over three centuries, the Afrikaners have proven themselves to be a resilient people, and de Klerk believes they can weather this unsteady period as well. Afrikaner hard-liners ruefully admit that their cherished history and people are fading away, but with Orania firmly entrenched on the scrub brush of the Great Karoo, it will be some time before the white tribe of Africa gasps its last breath. All photographs ©2008, Hungry Eye Images. James Kirchick is an assistant editor at the New Republic, a columnist for the Washington Examiner, and a frequent contributor to the Los Angeles Times and the Washington Blade. His writing has appeared in the Wall Street Journal Europe, International Herald Tribune, Jerusalem Post, USA Today, and Boston Herald.